This article is 2577 days old. Fire is out but smoke persists throughout Windsor’s largest apartment tower. For the second time in a week, fire has broken out at the Ouellette Manor Apartments (920 Ouellette Avenue). Firefighters responding to the scene noticed smoke and fire coming from a window near the ground. 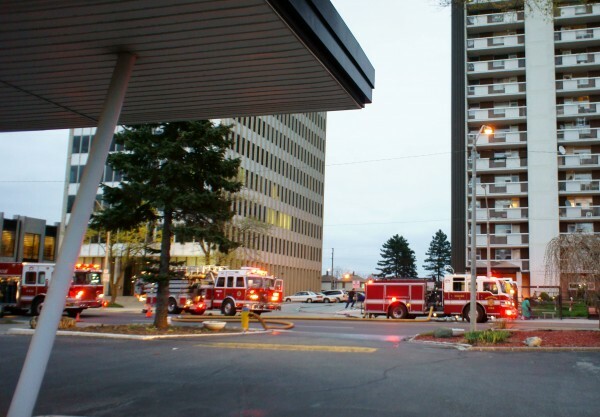 Firefighters quickly extinguished the fire but smoke spread throughout the entire 24-storey apartment. At this time there are no injuries; residents have been told to stay in their units and open their windows. Firefighters are working to remove smoke from the entire building, floor-by-floor using ventilation fans.